It's a question that has fixated philosophers for generations: What are the ingredients of a successful life? It's also a question that Patrice H. wrestles with in far grittier terms every day in the small Alabama town where she lives. Patrice, 42, works for an auto parts dealer building headlamps, and her definition of a quality life is straightforward but profound: "Working a job where I wouldn't have to live paycheck to paycheck and also have time to spend with my kids." Working 12 hours a day, six days a week for $9 an hour, Patrice finds herself weighing the school functions and weekend afternoons with her children that she misses against the grinding shifts she devotes to building them even a thin floor of economic security. "I have to see them less and work more in order for them to have a good life," says Patrice, whose full name and specific location we have withheld to preserve her anonymity. "And then on the weekends, if I'm off, I'm tired from working six or seven days of the week. It just makes it kind of difficult. You can succeed, but it's going to come with a price. You have to sacrifice." Like Patrice, many of the Americans surveyed in the 21st Allstate/National Journal Heartland Monitor Poll find it a daunting challenge to balance work, family, and their desire to contribute to their community. In an era when the median income has remained stagnant for an almost unprecedented 14 years, a powerful common theme in the survey--and follow-up interviews with respondents--was the sense that it is growing harder to support a family without working so many hours that it disrupts family life. "You go from being able to take care of your family on 40-50 hours a week to struggling on 40-50 hours a week," says Dan Collier, a National Guard contractor from Lexington, Ky., who responded to the poll. Collier, who recently took a second job to cover his bills, echoes Patrice when he says his greatest wish was to "be able to work a reasonable amount of hours while still providing for all of your family's needs, and some of the wants." This latest Heartland Monitor poll explored what Americans believe is necessary to "make work work": how well they believe they are managing their obligations at work, at home, and in their community and what they think could help them do better. National Journal and The Atlantic will be releasing the poll's results over the next week. On a variety of questions, the survey suggested, Americans place more weight on personal connections than financial success when defining a quality life. But the poll also captured widespread anxiety about whether most people can achieve both in today's economy. Overall, by 54% to 40%, a majority of those surveyed did agree that "most people can succeed at work, make a good living, and contribute to their family and their community, if they manage their time well and set the right priorities." Sara Stees, from Abington Md., is one who says she's successfully navigating the tightrope. After staying at home when her children were younger, she recently reentered the workforce as a health coach for an insurance company. And while she says not all parents can align their responsibilities at home and work, her employer has made it possible for her. "I happen to be with a company that is very, very focused on work-life balance, so that makes it much easier," she says. "You either give up time away from your family to be able to provide for your family, or you keep the time with your family and lower the quality of life that you're able to provide for them," says Collier, 44. "I used to be helpful in certain community service things; I can't do that anymore unless I take that time away from my family. Conversely, I can't do those things with my family anymore, because the time just isn't there." Related: Can quitting your job help end the war? A substantial gender gap separated attitudes on this question, too. Three-fifths of men surveyed said that most people could succeed at both work and home. But women split almost evenly: 48% said it was possible and 46% said it was not. Among women between ages 30 and 49, exactly half said it was not possible to succeed at both work and home. Joshlyn Lane, 40, a home health care provider for a nursing agency in Milwaukee, Wis., who responded to the poll, described the same agonizing choices as Patrice. A single mother with two sons, she works a schedule split into separate morning and evening shifts four days a week; that routine, she says, has never allowed her to attend one of her 17-year-old son's football games. "In today's society, I think it's more stressful for women because there's a lot more single parents out here. You have to work more hours and you have to sacrifice spending time with your children," she says. In these core working years of 30-49, those without college degrees were more likely than those with degrees to say success at both home and work was no longer possible. Those, like Lane, who worked hours other than the traditional 9 to 5 were similarly more likely than those who did to consider the balance unachievable. And those in this age group whose position at work qualified them as staff are split about evenly on whether the balance is beyond reach--and considerably less optimistic than either managers or senior executives. Parents in this age group were actually slightly less likely than the overall population to consider the balance unattainable (a difference within the poll's margin of error). But that finding may say as much about gender dynamics as economic conditions: While just one-third of fathers considered a stable home/work balance infeasible, nearly half (48%) of mothers did so. By far, the survey found, the most common obstacle that workers faced in balancing their obligations was going to work sick because they felt they could not miss the time: almost exactly half (49%) of current and former workers said they had done so. Just over one-fourth said they had missed "important family experiences because [they] were denied time off from work"; exactly one-fourth said they had fallen short at work because they needed to care for a child, spouse, or parent. Fifteen percent of those polled said they worked different shifts than their spouse or partner because they "could not provide day care for your children otherwise"; and 14% said they had been punished at work for missing time due to illness or caring for a family member. On several of these measures--for instance, "falling short" at work to care for another family member--women were slightly more likely than men to report a problem. But the bigger divide came between the 53% of workers who indicated that they still follow a conventional 9-to-5 schedule and the 47% who do not. Those outside of the 9-to-5 track were much more likely to say they had gone to work sick because they couldn't take time off; that they had missed personal experiences because of pressure to work; and that they had missed important family experiences because they were denied time off from work. And just over one-fifth of those outside of the 9-to-5 track said they have worked different shifts than their spouse or partner because that was the only way they could provide child care. Rachel Mistretta, 30, of Jamestown, N.Y., tried exactly that route, holding a job in the public school system and working opposite shifts from her husband to provide care for their two daughters. But she found that schedule "caused a lot of chaos for our children and in our home" -- and now she operates a part-time photography business out of her house so she can stay home with her kids. That decision, though, only set off another domino. To replace her lost income, her husband has needed to add more side jobs, which has left him facing a "constant struggle" to spend his own time with their children. 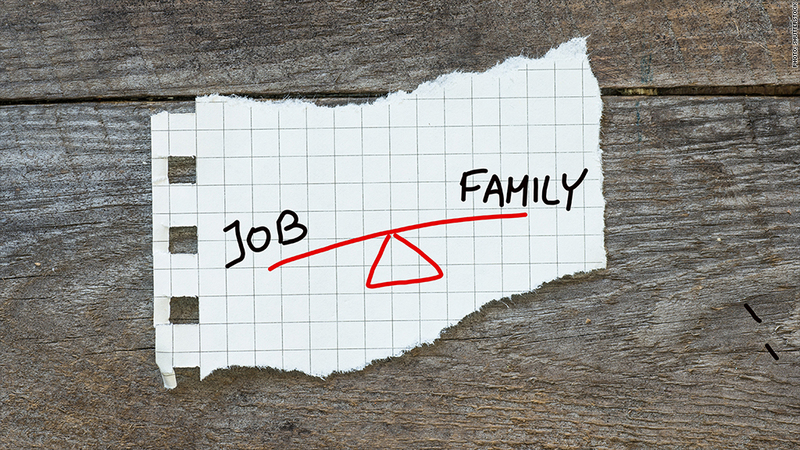 Such are the negotiations and trade-offs confronting many American workers as they struggle with the turbulent convergence of rising family demands and stagnant incomes. Janie Boschma contributed to this article.